Ever just want to search Google Images for just photos? Well, now you can. 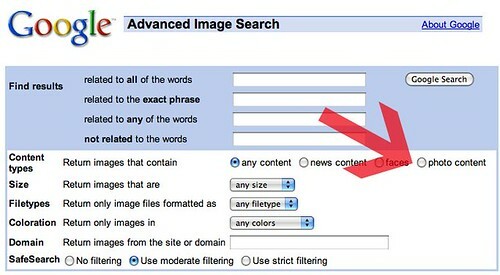 A WebmasterWorld thread reports that Google has added a new filter option to the advanced image search section of Google Image Search, for "photo content." So, now, if I am looking for photos of people with my name, I can easy find tons of them. If you do not like using radio buttons, just append the &imgtype=photo to the end of the Google Image Search string and you will restrict the results by photos. Previous story: Is Google's Matt Cutts Telling the Whole Truth & Nothing But The Truth?